An Interview with a Spindaroos Kid! 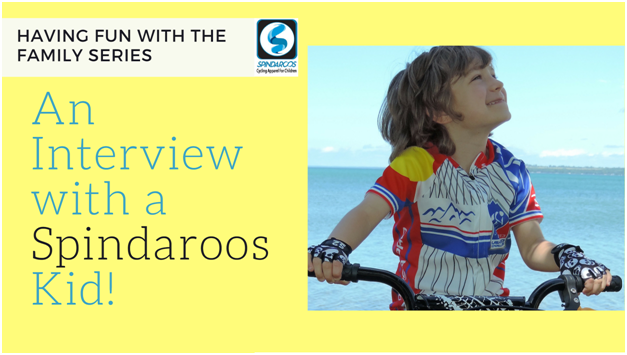 You hear from us all of the time about how much kids love their Spindaroos and how Spindaroos helps kids feel empowered and confident…aaaannnnd how awesome and fun our cycling gear is! And believe us when we say, we’ve got the proof to back up our claims in the form of the faces of every kid who’s worn our cycling gear. It’s true love! All that being said, we decided it might be nice to hear directly from one of the kids that wears and LOVES Spindaroos’ gear regularly, so we interviewed a long-time Spindaroos kid, 8-year old Jacob! He has been wearing Spindaroos gear for several years and currently has 3 Spindaroos Spin2Kids Cycling Jerseys, a pair of Spindaroos Cycling Gloves and a pair of Spindaroos Bike Shorts. Jacob was excited to tell us exactly how he felt about Spindaroos gear and talk about how much he loves to ride his bike.